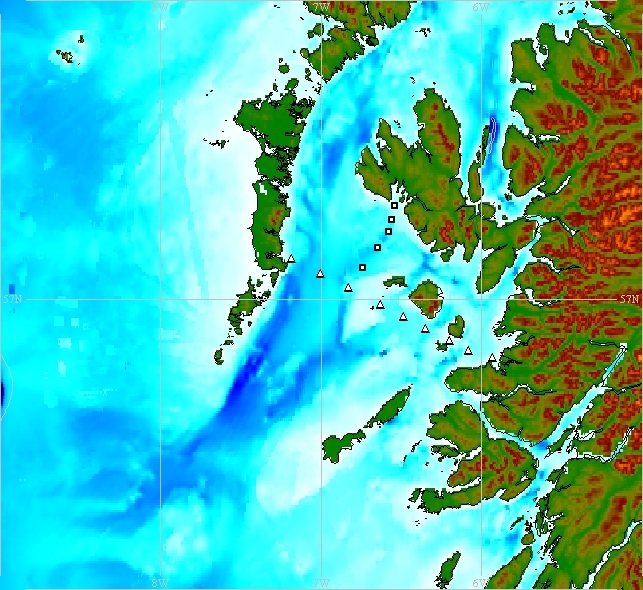 Line HD is a survey section crossing the Sea of the Hebrides, between Loch Boisdale (South Uist, Scotland) and Loch Moidart on the west coast of Scotland (to the south east of the Isles of Eigg and Muck). The line comprises nine fixed STD/CTD stations, which were established as part of routine monitoring work on the Scottish continental shelf by Dunstaffnage Marine Laboratory (DML). The line was occupied in the mid 1970s to early 1990s. Line HD has also occasionally been referred to as Line DN. Station HD6 is one of nine fixed STD/CTD stations crossing the Sea of the Hebrides, between South Uist and the west coast of Scotland. The station was established by scientists at Dunstaffnage Marine Laboratory (DML).